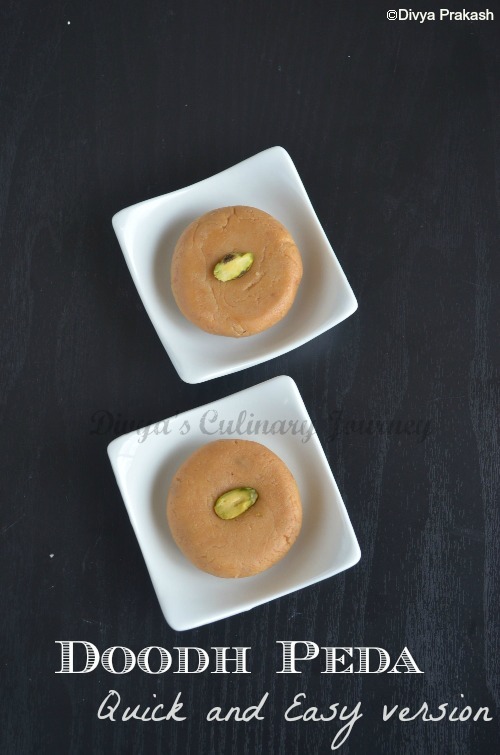 How to make doodh peda? Then mix the condensed milk and milk powder little by little such that it doesn't have any lumps. In low heat, keep stirring continuously until the mixture becomes thick and comes off from the sides. Turn off the heat and let it cool lightly until the mixture is warm enough to handle. Grease your hands, and make small balls and shape them to discs and press a pista or any nut of your choice in it. I got around 20 pedas. Let them cool completely. Store them in an airtight container and enjoy. 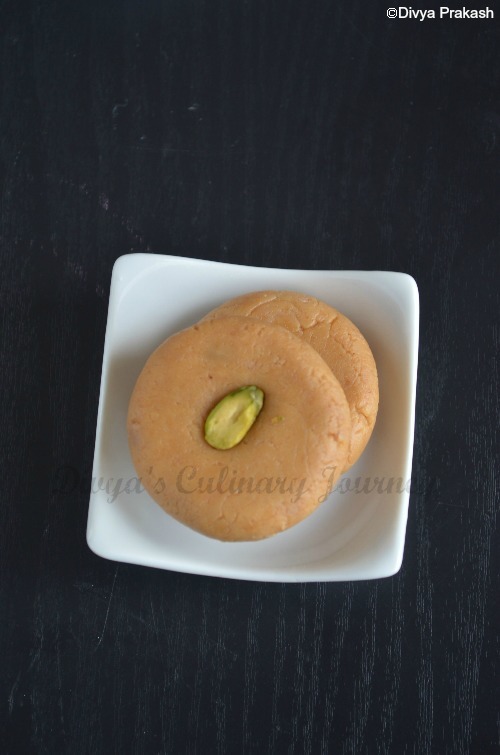 The original recipe called for milk powder, but I had milk mava powder at home so used it. So you can use milk powder too. Take care not to over cook the mixture. Then it turns dry and it cracks and peda wont be smooth. I used a tablespoon measure to scoop the mixtures, such that all pedas are of same size. beautiful.. u used milk and milk powder both ?? I love pedas, it looks delicious and yummy. Very easy as well, thank you for sharing. I too love them and yours look so perfect...Thanks for linking it...:)and girl I did like that cute bowl.. Perfectly shaped and delicious pedas, nice clicks..
Look so delicious, love the plate u have served. Cute and very attractive pedas, i do the same way too. simple yet beautiful presentation dear :) fabulous..
Pedas look delicious. What is milk mava powder? Delicious! One of my favourite desserts! 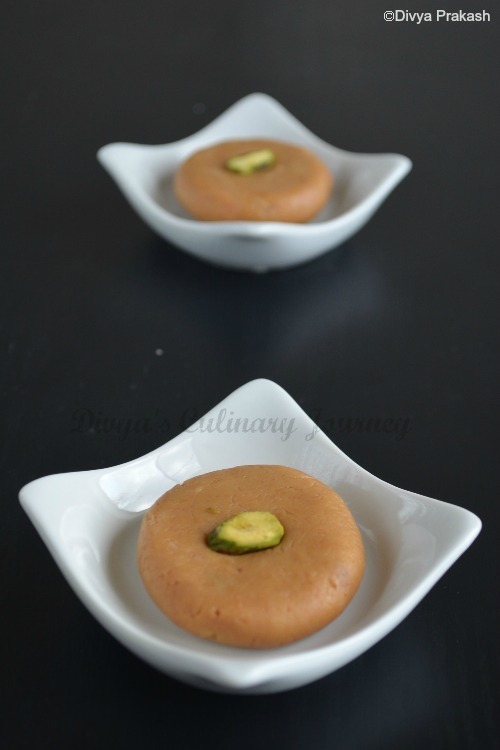 Delicious dooh peda Love it. 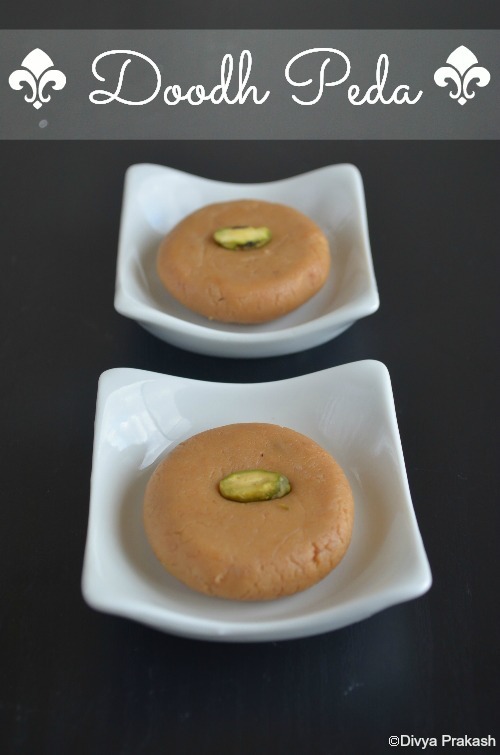 Doodh peda looks so nice.easy to make. Pedas are very nostalgic to me..Loved your recipe Divya. Wow! Such little ingredients, but it makes one good looking treat! Very tempting recipe.. Happy to follow you dear. Very healthy n yummy pedas and nice post.